Cáceres city centre has received several awards for its collection of historical monuments. Indeed, it was declared a World Heritage Site by UNESCO in 1986. Its Moorish walls enclose and preserve the second biggest water cistern in the world, a Jewish Quarter, the remains of Roman settlements and a unique and perfectly preserved collection of Medieval and Renaissance buildings. The first Romans to settle there did so on a hill near the Silver Way. Thus began the history of the city and a period that would come to an end with the Visigothic invasion in the 5th century. During the Christian reconquest, Abd al-Mumin decided to stay, until the Christian vanguard obliged him to build the sun-dried brick wall that still stands today. Nonetheless, this did not prevent Alfonso IX from entering the city on St. George's Day, 23 April 1229. Under the rule of Isabella of Castile the city experienced a period of prosperity and splendour, no doubt underpinned by the riches arriving from the Americas. The city was named capital of Upper Extremadura in 1822. Today it is the capital of the province of the same name; a place buzzing with life where you can enjoy a range of quality cultural and leisure attractions. 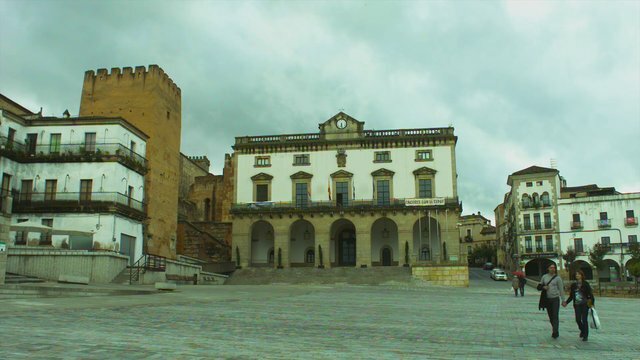 Cáceres is home to one of the four University of Extremadura campuses, the Womad music festival and the prestigious Helga de Alvear Visual Arts Centre. Its religious architecture, palaces and different family homes, as well as the towers along the city wall, make the historic quarter a real sight not be missed. From the Plaza Mayor you can see the Ermita de la Paz chapel and the Bujaco Tower, an Arab building which provides you with a panoramic view of the whole city. This tower is just one of the many that surround this part of the city, among which the Pulpit Tower and the Tower of the Wells deserve special mention. After passing under the Arch of the Star you have the Episcopal Palace, Carvajal Palace and the Romanesque and Gothic style Co-cathedral of Santa María, which is the oldest religious building in the city, standing as it does on a 13th-century church. From there on the city is dotted with beautiful nooks and crannies and ancestral palaces, with the following particularly deserving of your attention: the Casa de los Golfines de Abajo, the Casa de los Becerra and Plaza de San Jorge. Here you have the Church of San Francisco Javier and the nearby Church of San Mateo. Any stroll around these charming streets must include the Casa Mudéjar, the Casa del Sol the Solís mansion – with its Renaissance patio – as well as the Palacio de las Veletas (Cáceres Museum), built in the 15th century on the old Almohad citadel, which houses a large and well preserved water cistern. The Jewish Quarter and the Ermita de San Antonio chapel are nearby. An extensive and varied range of leisure and cultural attractions must be added to these treasures with events such as Holy Week (Fiesta of International Tourist Interest), the Birds Festival, the Classical Theater Festival and the Medieval Market of the three cultures. Also, this city and its surroundings have been the scene of the popular TV series "Game of Thrones". More information: Cáceres Office Tourist.